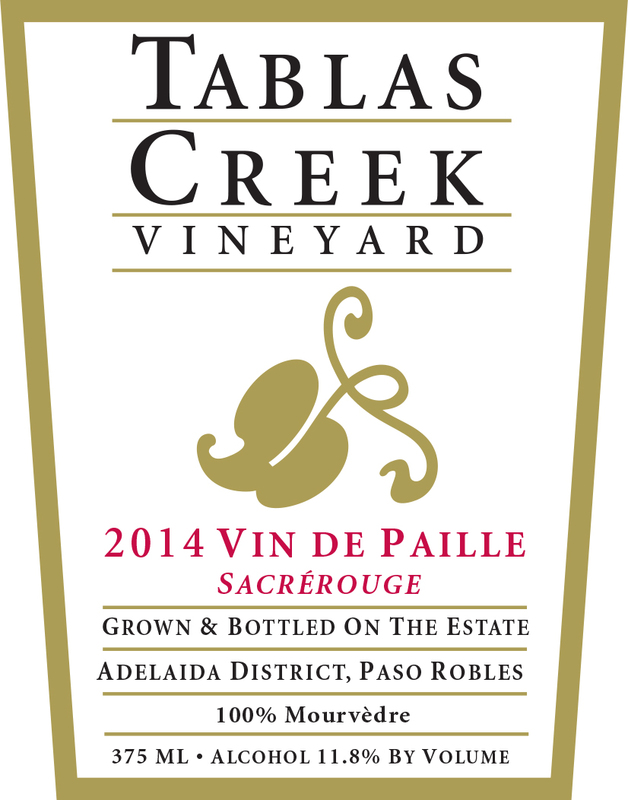 The 2014 Tablas Creek Vineyard Vin de Paille Sacrérouge is Tablas Creek’s sixth bottling of this non-traditional application (to red grapes) of an ancient Mediterranean technique for producing dessert wines. Ripe grape bunches are carefully laid down on straw-covered benches in our greenhouses, and allowed to dehydrate in the sun. When the grapes reach the desired concentration (usually in about 3 weeks) they are crushed by foot and fermented in small open-top fermenters using only native yeasts. When they reach their desired level of extraction, we press them and move the juice to oak barrels to continue fermenting until it reaches an alcohol level where the sweetness of the wine is in balance with its acids, tannins, and mineral characteristics. The Vin de Paille Sacrérouge is made from 100% Mourvèdre grapes. The 2014 Vin de Paille Sacrérouge has a compelling nose of mint chocolate, black figs and hoisin. The mouth, in its youth, is quite primary, with sweet flavors of golden raisin, sea salt caramel, red licorice and fig. The wine's tannins refresh on the finish. We expect this wine to deepen and add notes of chocolate and earth with age. Drink now or hold for up to two decades. The grapes for our Vin de Paille Sacrérouge were grown on our certified organic estate vineyard. The 2014 vintage was our third consecutive drought year and saw our earliest-ever beginning to the growing season. The summer was warm but without serious heat spikes, and our coolest August in a decade slowed ripening at a critical period. When it warmed back up in September, the fruit tumbled in, and we finished in mid-October, about two weeks earlier than normal. The result was a vintage with excellent concentration balanced by good freshness, which should be vibrant and powerful young, but with the balance to age. The Mourvedre was harvested September 4th through October 6th. The wine, after pressing, was aged in three new French oak barrels for 15 months before being bottled in April of 2016.